Describing neonatal and maternal mortality rates as a matter of grave concern, Prime Minister Narendra Modi on Saturday said his government wanted to effectively use its 'Make in India' and 'Digital India' campaigns to reach healthcare to the country's poorest of the poor. Stressing upon cleanliness and hygiene, he said preventive care was the most important component of overall healthcare and also inexpensive. "It is embarrassing to compare healthcare facilities in our country with those available abroad. Neonatal mortality is a matter of grave concern and so is maternal mortality. "When a child falls into a borewell, families sit in front of TVs and the media gives a running commentary as gloom prevails everywhere, but we are hardly aware that hundreds of children die soon after being born. Many times, the mother and child both die for want of primary healthcare," he said after inaugurating the refurbished and partly newly-built H N Reliance Foundation Hospital. Addressing the gathering which included Reliance Industries chairman Mukesh Ambani, his wife and Reliance Foundation chairperson Nita, megastar Amitabh Bachchan, cricket icon Sachin Tendulkar and Sunil Gavaskar, Modi said he wanted 'Make in India' and 'Digital India' initiatives effective tools to reach best healthcare facilities to the people. "Today, when diagnostic machines have replaced the doctor's expertise to a large extent, I want companies to come to India and manufacture expensive equipment needed for medical treatment, I want FDI to come into the sector. "If hospitals like this are part of the network providing medical advice through telemedicine, quality healthcare can reach people living in remote areas for which Digital India can come in handy. I want the Digital India initiative to be effectively used for improving medicare and education," he said. In ancient times, the Prime Minister said, India had marked new frontiers in the field of science. "Mahabharata says Karna was not born out of his mother's womb. This means people then were aware of genetic science. There must have been a plastic surgeon who fixed an elephant's head on Ganesha," he said, adding what mathematician Aryabhata said centuries ago, world has accepted now. 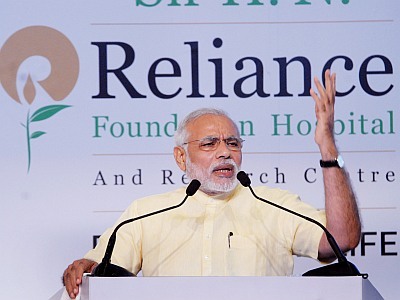 Modi said like the "kayakalp" (renewal) of the 98-year-old hospital by the Reliance Foundation, it was possible to "renew and transform" the nation. "A true leader works with the intention of wiping the tears of the poor," he said, adding "the path of health assurance is more difficult than that of health insurance, but achievable". Sir Harkissondas Narottamdas hospital was founded in 1925 as Mumbai’s first general hospital. The hospital celebrated its silver jubilee with Sardar Vallabhbhai Patel as its chief guest and the Golden Jubilee celebrations were graced by Jayaprakash Narayan. During pre-independence period, it treated many freedom fighters, including Mahatma Gandhi. In 1997, the Reliance Foundation joined hands with the hospital, which has since undergone major renovation and expansion to become one of the most modern hospitals in South Mumbai. The heritage building of the hospital has been refurbished, while a new 19 floor structure, with state-of-the-art medical equipments, has been added. The hospital is also equipped with robotic surgery and on-line video conferencing for global consultations. The hospital plans to reserve a fifth of its capacity for the underprivileged and provide 10 per cent beds for free to the needy and another 10 per cent at subsidised rates. Modi, who is pursuing his 'Clean India' campaign with great zeal, underscored the importance of hygiene and preventive care to stay healthy. "Preventive care is the most important component of healthcare. Getting treatment for a disease is expensive, staying healthy is inexpensive. If people get clean drinking water, they will not be afflicted by a number of diseases," he said. Recalling how as chief minister of Gujarat he had developed the Sabarmati riverfront by rejuvenating the parched river with water from Narmada, he said, it helped tackle drinking water problem in Ahmedabad city. "Water table rose and people started getting pure drinking water. Earlier, the poor of the city thronged hospitals due to poor quality of drinking water, but now, in the last 10 years, there has been no epidemic in Ahmedabad," he said. Referring to a survey, the Prime Minister said the cause of untimely death of 40 per cent of the children in Pakistan was because they did not wash their hands before eating. "We are no different, we share the same legacy," he said and lauded Madhya Pradesh government's initiative when lakhs of school children created a new world record by collectively washing their hands on Global Handwashing Day. "Time has come for the country to start from here," he said. The Prime Minister referred to his address to UN General Assembly in which he had pitched for observation of International Yoga Day and said holistic healthcare was the need of the present times. "Today, the atmosphere is in favour of holistic healthcare... for transformation from stressful life to stress free life. It's time we start respecting life," he said.